For some, ‘all-terrain vehicle’ (ATV) is synonymous with freedom and flexibility. It invokes exhilarating images of quad biking over dusty hills and through muddy ditches, with no one holding you back. The truth is, despite how sturdy a quad bike looks and how much fun they are to ride, it can be an unstable vehicle that requires experience and skill to control effectively. If you haven’t driven for a long time or you’re a beginner, training is essential. One of the primary causes of accidents involving quad bikes and ATVs is a lack of training or protective equipment. Quads can roll easily, especially off-road, and without suitable preparation it’s easy for things to go wrong. This article is packed with tips that will help to keep quad riders of all abilities safe, so that they can enjoy their machine and embrace the freedom it offers. If you are a new rider, make sure that you choose a vehicle that matches your level of strength and experience. Driving a quad bike is very physical and it is important that the power and weight of your vehicle are not too much for you to handle. Learn more in our quad bike buyer’s guide. Quad bikes that have been in use for more than three years must pass an MOT if they are to be used on public roads, according to the UK’s Highway Code rules. This means having safety features like hazard warning lights, a brake light and speedometer. Whoever is driving requires a full car licence or motorcycle category B1 licence, and the vehicle will need at least third-party insurance. An important aspect of quad bike safety is ensuring you have the correct tyres fitted. Quad bike tyres are identified by three numbers (for example, 25×8-12.) The first two numbers are the height and the width of the tyre. The third number is the size of the rim that the tyres are made for. Some riders choose to fit tyres that add an inch or more height to improve off-road performance, switching to road-legal tyres only when needed. Most vehicles can cope with a 1-2 level size increase over the manufacturer’s recommended tyre size. However, the added weight can have a negative impact and can affect handling as well as increase wear and tear on the clutch, drive belt and engine. This is because all the components will all have to work harder to compensate for the increased tyre size. To make sure your new tyres are suitable for your quad, do not increase the tyres by more than two sizes on vehicles larger that 500cc, and no more than one size on smaller vehicles. Quad bikes do not have roll cages, weather coverings or seatbelts. Much of this is so that the driver can easily escape the vehicle in case of an accident, though seatbelts are not used due to the movement required to successfully manoeuvre the vehicle. And of course, this adds to the appeal of riding an ATV and the adrenalin rush the rider experiences. However, without built-in safety measures, having the right protective clothing is important for preventing injury. The greatest risk of serious injury is to your head. For this reason, the most important piece of gear you can wear is a helmet. When choosing a helmet, the key considerations should be comfort and safety. Make sure you select a visor that will allow you to see as clearly as possible. This may mean choosing a tinted visor for sunny days. If you decide not to use a full-face helmet, consider wearing goggles to protect your vision and to guard against debris your tyres can throw up. Full-face helmets offer the best protection due to having a built-in face shield which protects the mouth and chin. Open-face helmets offer the least protection and do not include anything to cover your chin and mouth. Motocross helmets designed for the most aggressive riders and offer the most protection. It is important to get the right fit as it can affect your safety as well as your comfort. A well-fitting helmet may seem tight at first, but will be stable as you move your head and will remain comfortable after wearing for extended periods. Though wearing a helmet it is not a legal requirement for quad bike riders in England, Scotland and Wales, it is law in Northern Ireland and you can be fined up to £500 for not wearing one. Your clothing should be practical. Long sleeves and trousers are a simple way to minimise small cuts and grazes, although it’s worth considering lightweight body armour. This can be worn under a sweatshirt or long-sleeved t-shirt to give you extra protection in the event of an accident. The wide variety of specialist gloves available for quads and off-road bikes means it’s easy to find a pair that are padded, comfortable and provide grip. Whether you’re riding on- or off- road, decent gloves are a must. Fingerless gloves are better for keeping cool during the summer months, but full gloves offer more comfort, grip and protection. For the winter months, handlebar mitts are great for comfort and safety. Unlike typical gloves, mitts wrap around both the rider’s hands and the handlebars, keeping your hands warm and preventing numbness from affecting your grip in cold conditions. Your boots should be at least ankle-high to ensure they do not slip off while riding. Most motorcycle boots are suitable and offer adequate protection. There are plenty of casual styles available, as well as specific off-road styles that come with additional padding and a higher level of protection. If you can’t afford biking boots or if you’re only riding for a short time, make sure your footwear is sturdy and covers your whole foot. Avoid ballet pumps, open-toed shoes, sandals, backless shoes or any other footwear that leaves your feet exposed or are at risk of coming off. While quad bikes bear some resemblance to cars, the mechanics are quite different. 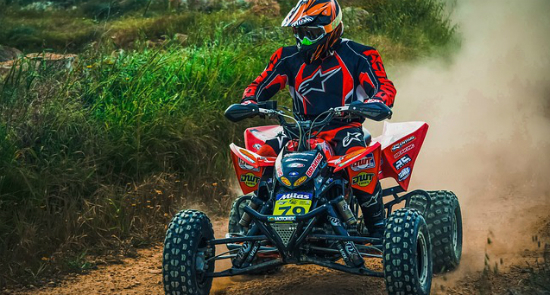 Most quads and ATVs have a solid rear axle meaning that the rider has to adjust their position to help the vehicle turn. The rule of thumb is to shift your weight to the outside footrest when cornering at low speeds, but to lean your body into the turn. At higher speeds the momentum will pull the quad weight to the outside of the turn, so focus on leaning in and keeping your weight inside the turn as well. When driving up an incline, do so in a low gear and with your weight forward. A low gear should also be used for going downhill, but your weight should be towards the back. Do not carry passengers or equipment unless your vehicle has been designed for them. If you have to park on a slope, make sure that your quad is parked facing sideways rather than up or down the slope. If you are driving on your own, keep a mobile phone or GPS tracker with you. This way you can contact someone or be located if you get into trouble. Never let a child ride an adult-sized quad, as they won’t have the power and weight required to handle the bike. Not only this, but in the case of an accident, the vehicle could cause fatal crush injuries if it rolled on top of them. Ride with as much care as you would on two wheels. The most important thing to remember is that falls from a quad often happen on corners and slopes. In these cases, the rider and bike are likely to roll in the same direction, risking serious injury or death. Do not take risks on a quad bike and make sure that you’ve had sufficient training before heading out onto dirt tracks or roads. For on-road riders and further peace of mind off-road, Bikesure’s specialist quad bike insurance can help you to find cheap insurance. Get your quad bike insurance quote today. Safe use of all-terrain vehicles (ATVs) in agriculture and forestry.